A dangerous triple threat cheese created with Chi fusion. Each Master Mouse is able to sense the unique flavourful scent that individually compels them. This tantalizing delectable treat is fought over by all three Masters within the Grand Pagoda. Master Fusion Cheese can be crafted with the proper ingredients. 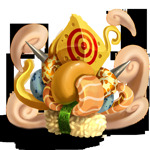 Master Fusion Cheese is used to attract Master of the Chi Belt, Master of the Chi Claw and Master of the Chi Fang in Furoma Rift. It will not attract any other mice. Stale Cheese - Produced by Master Fusion Cheese when it fails to attract a mouse and goes stale. 18 May 2016: Master Fusion Cheese was released with the release of Furoma Rift. This page was last edited on 2 June 2016, at 06:05.